College hockey players and commits made up for 67 of the 217 picks in the 2018 NHL Entry Draft. Seven of them were selected in the first round, including both Brady Tkachuk and Quinn Hughes who found their new homes within the first ten picks. The NCAA has made an ever-increasing impact on the NHL as 32% of the league’s players this year used college to jump-start their ice hockey careers. In fact, this summer’s draft saw the highest number of NCAA players drafted since 2007 when a total of 75 players were taken. Overall, 42 forwards, 19 defensemen, and six goaltenders were selected from the college hockey circuit this year with a whopping 39 players being drafted within the first four rounds. Focusing on the first round, the seven NCAA players selected within the first 31 picks will no doubt make a big impact on their respective college teams in pursuit of promising NHL careers. The name Tkachuk comes with high expectations which is just what the Boston University winger has lived up to after his freshman year with the Terriers. During the 2017-18 season, Tkachuk became known as more of a playmaker than a scorer, tallying eight assists in his first twelve games – seven of which were deemed the primary helper. In his 14th game, Tkachuk scored his first goal, paving the way to an eight-goal, 23-assist season in 40 games. The performance earned the 18-year-old the fourth-overall pick in the draft this summer resulting in his joining of an Ottawa Senators team in need of a fresh start. Tkachuk has a nose for the crease, often parking his 6-foot-3-inch frame in front of the opposing goaltender. Beyond the traditional power-forward role, he has remarkable stick skills that allow him to make quick passes and rifle off shots without giving defenders a hint at what action he is about to take. For a player of his size, the Terrier has tremendous speed that, when used to crash the net, has proved to be lethal. While he is expected to complete the 2018-19 season in Boston, Tkachuk will likely see NHL time sooner rather than later. Hughes tallied five goals and 24 assists in 37 games during the 2017-18 season. The Michigan freshman is a 5-foot-10-inch puck-moving defenseman who plays a similar style of game to Torey Krug of the Boston Bruins. While Hughes needs to improve his play on the defensive side of the puck, he will have every opportunity to do so in his sophomore year with the Wolverines. The 18-year-old’s displays the confidence of an upperclassman, however, jumping up into the rush on a whim, allowing his speed to get him back into position and not leave his partner hanging if an opposition counterattack ensues. While he is able to keep up with the opposition due to said speed, Hughes is easily outmuscled along the boards and in front of the net. However, the defenseman has already excelled under the pressures of big-time games, aiding his team to the Frozen Four this past season. The Vancouver Canucks, in need of a blueliner with offensive upside, drafted the Wolverine with the seventh overall pick in the draft. Oliver Wahlstrom is a natural goal-scorer potting 22 goals and 23 assists in 26 games with the U.S. Under-18 National Team this past season. Beyond scoring goals, however, Wahlstrom is gifted in many other ways. He has the ability to play both on the power play and the penalty kill due to his diverse skill set and dance around opposing defensemen whenever he sees fit. The 6-foot-1, 205-pound forward originally committed to the University of New Hampshire at the age of 13 before de-committing and shifting course for Boston College. Though the Eagles finished atop the Hockey East division standings this past season, they have not made it to the NCAA Tournament in two years. With a great addition in Wahlstrom entering play for this upcoming campaign, Boston College will be looking to make it to the national stage once more. 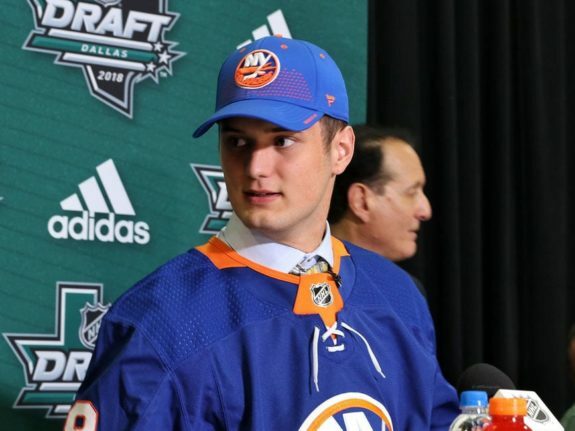 Beyond that, the New York Islanders should be happy with their eleventh-overall selection in the draft this year as he enters the next stage of his hockey career. 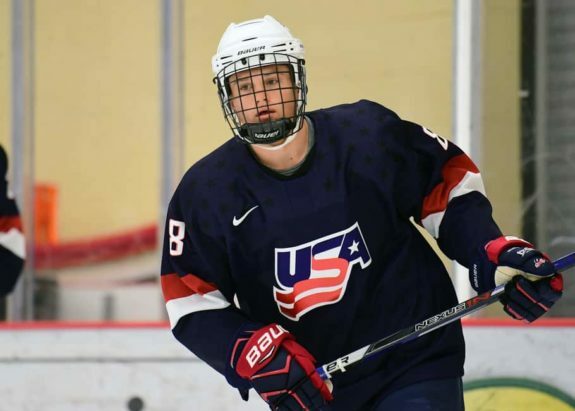 Captaining the U.S. Under-18 National Team this past season, there is no questioning Joel Farabee’s role as a leader – an impressive trait in an 18-year-old. The 5-foot-11-inch winger found himself on the same line as Wahlstrom who was taken just three picks before the Philadelphia Flyers selected Farabee with the fourteenth-overall pick. The New York native will play for Boston University next season on the same roster as Tkachuk. The winger put up 15 goals and 25 assists during the 2017-18 campaign in just 26 appearances. As a strong skater with a lethal shot, Farabee is a dangerous offensive weapon who is also able to play a consistent two-way game. An asterisk next to his game, however, is his size. If Farabee can find a way to combat the taller, stronger, and older opponents at the college level, he will find himself in a Flyers jersey in no time. Jay O’Brien was one of the most surprising selections of the first round at this summer’s draft. 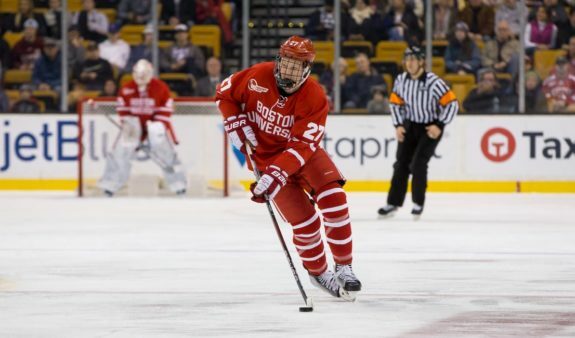 Though many expected O’Brien to go in the early stages of the second round, he was taken nineteenth-overall and is set to join Farabee in Philadelphia’s prospect pool. He will, however, be developing at the college level some 50 miles south of his fellow Flyer at Providence College. O’Brien played with Thayer Academy this past season, accumulating 43 goals and a total of 80 points in just 30 games. Time will tell if the forward’s NHL squad made the right call in drafting him so early – likely a good amount of time considering the fact that the 5-foot-11-inch skater has seen little competition outside the high school level. He will be joining a vast cast of NHL draftees including 2015 third-round pick Erik Foley (Winnipeg Jets) and 2016 second-round pick Kasper Bjorkvist (Pittsburgh Penguins). K’Andre Miller was widely considered a late-first-round selection, which is just where he fell in the draft when the New York Rangers took him with the 22nd pick. The 18-year-old from Minnesota sports the successful story of a forward who transformed into a defenseman, allowing him to develop a valuable all-around game. With the U.S. Under-18 National Team this past season, Miller produced four goals and 12 assists in 22 appearances. He maintained a plus-minus rating of plus-13 and avoided the inside of the penalty box with just six penalty minutes during the 2017-18 campaign. Miller will start his freshman year at the University of Wisconsin come September where he will join a fellow first-round pick, Trent Frederic, who was taken 29th overall in the 2016 NHL Entry Draft by the Bruins. This season, the 6-foot-4-inch defenseman will get the chance to face tough customers such as North Dakota, Minnesota, Ohio State, Michigan, and Penn State – all in the month of November alone. The NCAA will be a big test for Miller as he joins the Big Ten conference, but his size should give him a foothold as he is pinned against older players. The Ottawa Senators, who took seven NCAA players in total this draft, made Jacob Bernard-Docker their second such player with the 26th pick of the 2018 NHL Entry Draft. 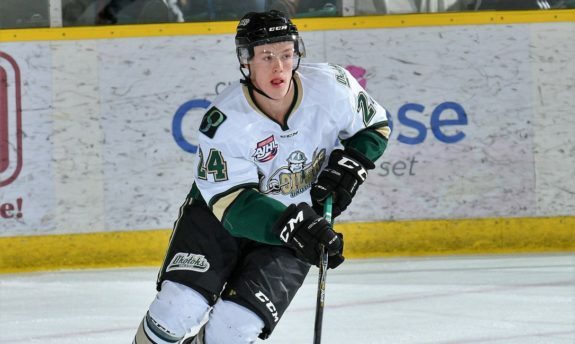 With a strong season with the Okotoks Oilers of the Alberta Junior Hockey League (AJHL), the defenseman earned his way into the first round despite his being considered an early-second-round selection prior to the draft. He registered 20 goals and 21 assists in 49 appearances with Okotoks this past year. Bernard-Docker is the case of a Canadian player who opted to continue his development in the NCAA as opposed to a Canadian junior league. With a clear offensive upside, the 18-year-old will make a fine addition to the University of North Dakota as they continue their quest for the organization’s ninth NCAA title, taking their eighth just two years ago in 2016. Expect to see Bernard-Docker manage the number of risks he takes, as his offensive mobility sometimes interferes with his primary function as a defenseman. The AJHL’s Most Outstanding Defenseman during the 2017-18 season will be looking to make an immediate impact at the NCAA level.